Professor Eben Archer – teaching us about the essence of the vine | Welcome to Fairview's Blog! 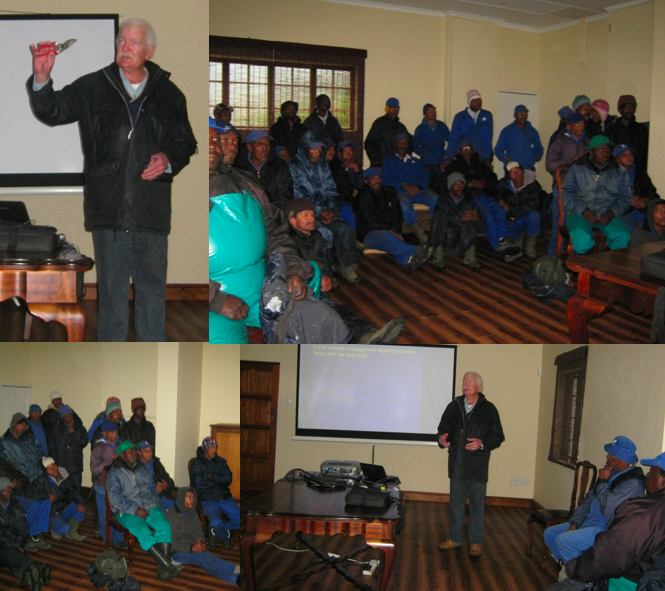 On a very cold and rainy Thursday morning, Prof Eben Archer visited Fairview to share some of his knowledge with our vineyard team. His ongoing research in the field of viticulture has not only branded him as a pioneer, his studies at research centre Nietvoorbij during South Africa’s isolation years made him one of the foremost advancers of the local wine trade – even during sanctions he was a key player who ensured that, scientifically, the SA wine industry was on par with the rest of the world. Prof Archer started his viticultural career as researcher at Nietvoorbij in Stellenbosch in 1971 – where he was aided by the most basic of equipment, “a set of secateurs and a scale” – before assuming a position as lecturer at Stellenbosch University. He held both positions for 17 years, years which would prove invaluable to the wine industry. During those years he studied towards a PhD at the University of Montpellier in France and has demonstrated his understanding of the vine, consulting to wineries in France, Mendoza, Stellenbosch and Chile, among others. As a lecturer he has been a mentor to hundreds of winemakers who today determine what we drink (source winemag.co.za, click here to read more).